"Don't cheat the world of your contribution. Give it what you've got." The experiment included four types of liquid media which varied in nutritional complexity. Once transformed, the controls and test devices were cultured according to the 2017 Interlab protocol. Each media trial consisted of two replicates of each device and control. After six hours of monitored growth, the mean fluorescence intensities (MFI) of all the samples were measured with a BDFACScanto flow cytometer. Finally, the MFIs for each device were compiled and compared with FlowJo software by media type. 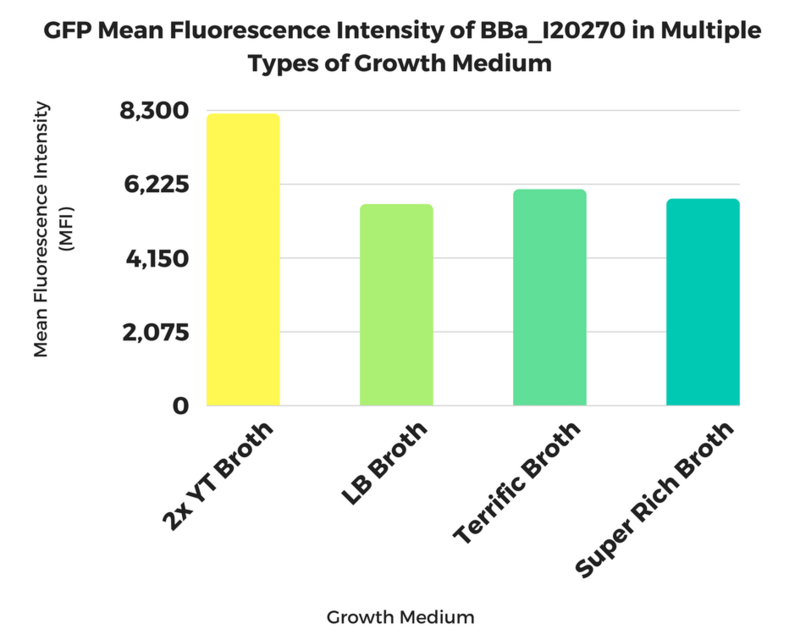 Mean Fluorescence Intensity measured by flow cytometry of GFP expressed from 6-hour cultures of BBa_I20270 in multiple growth mediums. 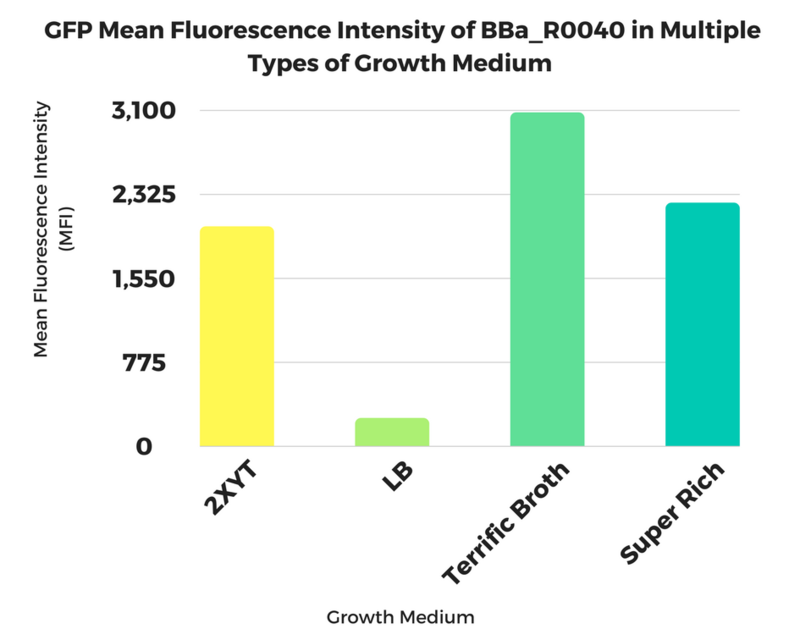 Mean Fluorescence Intensity measured by flow cytometry of GFP expressed from 6-hour cultures of BBa_R0040 in multiple growth mediums. 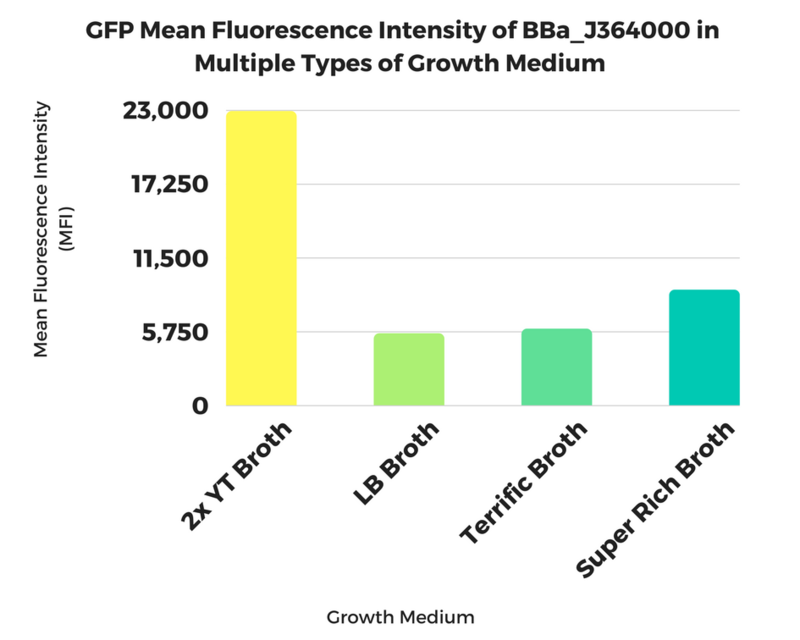 Mean Fluorescence Intensity measured by flow cytometry of GFP expressed from 6-hour cultures of BBa_J364000 in multiple growth mediums. 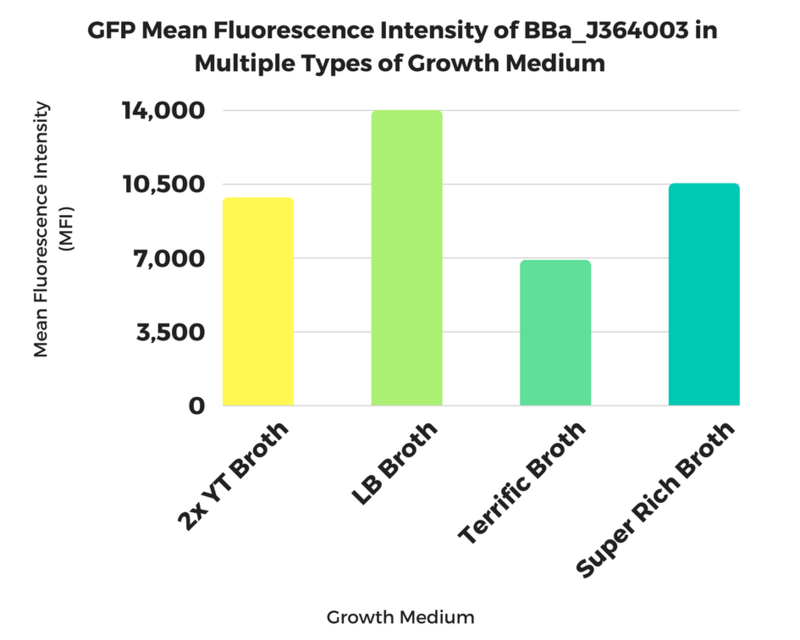 Mean Fluorescence Intensity measured by flow cytometry of GFP expressed from 6-hour cultures of BBa_J364001 in multiple growth mediums. 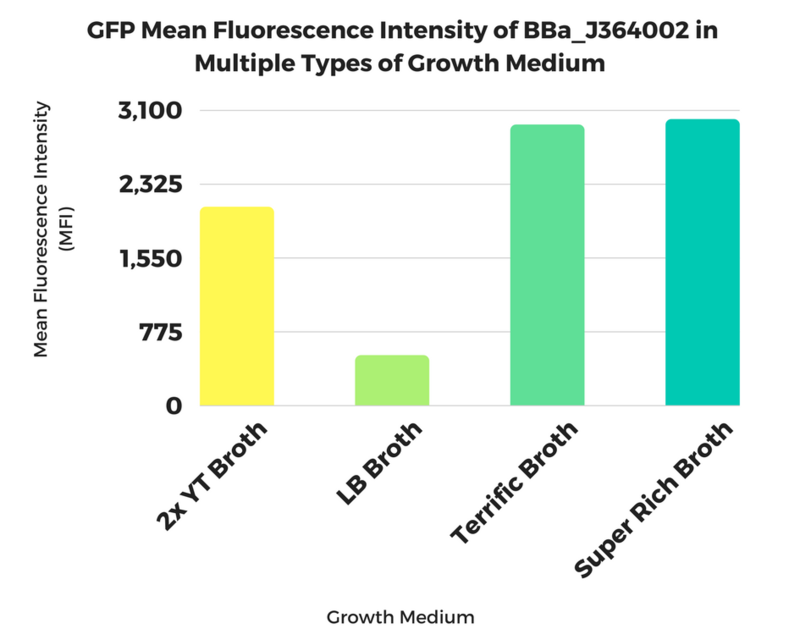 Mean Fluorescence Intensity measured by flow cytometry of GFP expressed from 6-hour cultures of BBa_J364002 in multiple growth mediums. 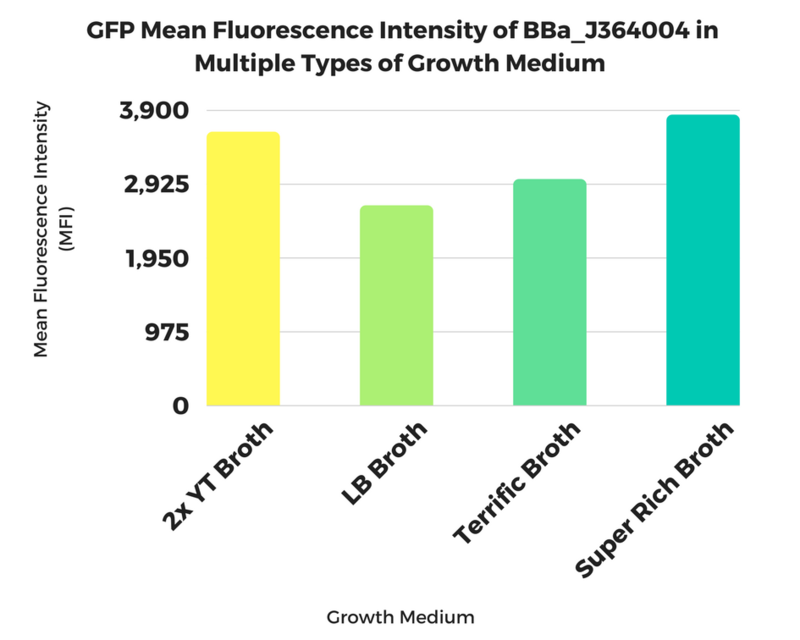 Mean Fluorescence Intensity measured by flow cytometry of GFP expressed from 6-hour cultures of BBa_J364003 in multiple growth mediums. 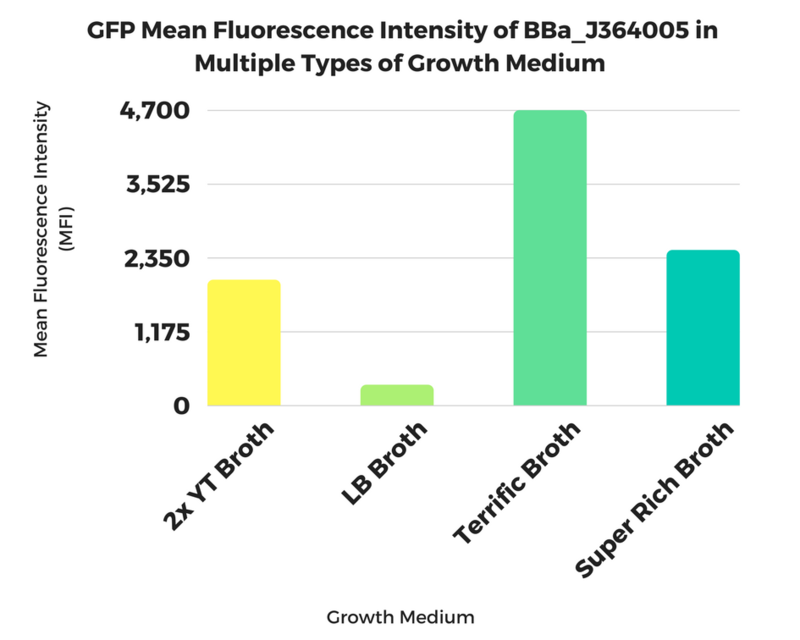 Mean Fluorescence Intensity measured by flow cytometry of GFP expressed from 6-hour cultures of BBa_J364004 in multiple growth mediums.